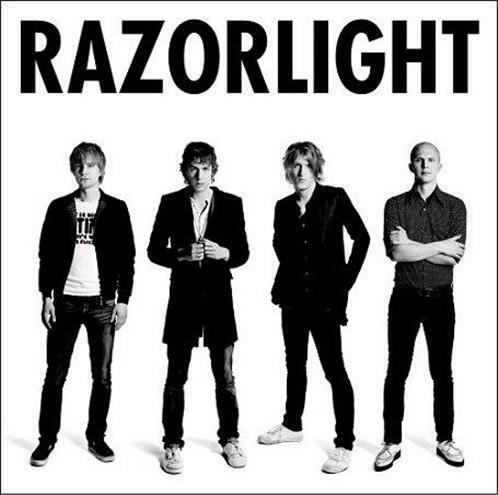 Razorlight was a British based indie rock band formed in 2002 by lead singer and rhythm guitarist Johnny Borrell. The band are primarily known in the UK, having topped the charts with the 2006 single "America" and its parent self-titled album, their second. Along with Borrell, the current lineup of the band consisted of drummer David 'Skully' Sullivan Kaplan, bass player Freddie Stitz and lead guitarist Gus Robertson. As of 2013, the band is on hiatus. Razorlight debut album, Up All Night, was released on 28 June 2004, reaching number 3 in the UK album charts. The critical reception was generally good, receiving good reviews from NME, Q magazine and Billboard, although they were also accused of lack of imagination and unoriginality for allegedly borrowing ideas from other influential bands such as The Strokes. Following the successful release of their debut album, drummer Christian Smith-Pancorvo left the group and was replaced by Andy Burrows. Up All Night was re-issued in April 2005, including the previously unreleased single "Somewhere Else", which peaked at Number 2. Razorlight released their second album Razorlight on 17 July 2006, in the United Kingdom and it debuted at No. 1 in the UK Albums Chart a week later. It received mixed reviews, Q magazine giving it a rare 5/5 rating, whilst Pitchfork Media gave it 2.8/10. Razorlight is the album by which many of the original Razorlight fans lost interest in the band, and some accused them of 'selling-out' by diluting their raw, edgy rock sound to cater for a new, radio-friendly mainstream audience. The lead single from the album, "In the Morning" was released as a single on 3 July 2006, which peaked at No. 3 in the UK Singles Chart. To date, it is their third biggest single after "Somewhere Else", which peaked at No. 2, and "America", which peaked at #1. It also reached No. 2 on iTunes. In 2007, Razorlight were nominated for two BRIT Awards one for 'Best British Band' and the other for 'Best Song', "America". They were also nominated for two NME Brit Awards for 'Best Band' and 'Best Album'. After many months of producing new material, some of which was written on the Isle of Tiree in the Inner Hebrides, Razorlight released their third studio album, Slipway Fires, on 3 November 2008 with the lead single, "Wire to Wire", being released on 20 October 2008.